The new year begins on a sad note for the environmental community mourning the tragic drowning last week of Rebecca Tarbotton in Mexico. The Executive Director of The Rainforest Action Network is remembered by RAN's Forest Program Director, Lindsey Allen. Peter Kelley share America's Wind Energy Association's response to the 11th hour congressional passage of the Production Tax Credit for wind. Climate activist and author Elli Sparks shares her hopes for 2013! A bona fide presidential candidate joins Betsy - Dr. Jill Stein, presumptive nominee of America's Green Party (the other one! ), will share her platform which includes The Green New Deal. D.R. Tucker and I learn more about REAL Green Party and we like what we hear! See what you think about the actual prospects, and what's possible, for making a difference in the 2012 Presidential race! Michael Stafford: "GOP Stuck In A Conservative Wonderland"
"GOP Stuck In A Conservative Wonderland". Michael Stafford is a Republican with some tough questions about his party's decline into extreme distortions of the facts, most notably in questioning the science of evolution and climate change. His insights are especially timely and valuable as he compares the surreality of this political moment to not so distant history. Todd Tanner, a hunter and sportsman is offering to give up his gun to anyone who can prove that climate change is not real. The founder and chairman of "Conservation Hawks" joins D.R. Tucker and Betsy to discuss why deniers are shooting themselves in the foot by hanging onto their "belief" that they disbelieve climate scientists! Dr. Craig Jenkins: climate scientists need to rethink their strategy. One of the authors of recent research demonstrating a clear connection between media coverage, political statements and public concern about climate change is our guest. Dr. Craig Jenkins is Professor of Sociology, Environmental and Political Science at Ohio State University. Climate convert and blogger, D.R. Tucker joins me as we get the highlights of this important study. A day after The League of Conservation Voters declared this Congress the most anti-environment of any before it, we'll get reaction from David Jenkins of Republicans For Environmental Protection. My favorite Republican climate convert, DR Tucker, joins me for that interview. D.R. Tucker joins me to weigh in on all the news, plus Jon Huntsman's withdrawal from race leaving no climate "believers" in the Republican race to the White House. A check-in from D.R. Tucker with a year-end view of the latest eco shenanigans. Climate convert and Green Front friend, D.R. Tucker, joins Betsy to chat with Carol Oldham and Joe Elcock with the National Wildlife Federation in Massachusetts. 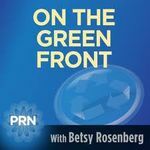 They discuss attacks on The Clean Air Act, and share predictions about the death of climate denialism. LISTEN to CAROL, JOE and D.R. D. R. Tucker, on the past week's top climate SUReality stories! Conservative blogger, climate convert and content aggregator extraordinaire, D.R. Tucker joins me to discuss the latest schemes and tactics of denialists. From a faux controversy over light bulb choice to Michelle Bachman's sanity, the inanity of it all will be our focus. Conservative blogger and free-lance writer D.R. Tucker talks about his column Confessions of a Climate Change Convert.